Nickel cobalt sulfides (Ni-Co-S) have attracted extensive attention for application in electronic devices owing to their excellent conductivity and high electrochemical capacitance. To facilitate the large-scale practical application of Ni-Co-S, the excellent rate capability and cyclic stability of these compounds must be fully exploited. 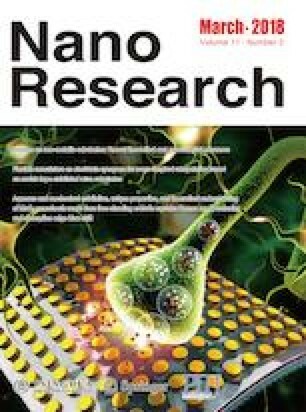 Thus, hierarchical Ni-Co-S@Ni-W-O (Ni-Co-S-W) core/shell hybrid nanosheet arrays on nickel foam were designed and synthesized herein via a facile three-step hydrothermal method, followed by annealing in a tubular furnace under argon atmosphere. The hybrid structure was directly assembled as a free-standing electrode, which exhibited a high specific capacitance of 1,988 F·g−1 at 2 A·g−1 and retained an excellent capacitance of approximately 1,500 F·g−1 at 30 A·g−1, which is superior to the performance of the pristine Ni-Co-S nanosheet electrode. The assembled asymmetric supercapacitors achieved high specific capacitance (155 F·g−1 at 1 A·g−1), electrochemical stability, and a high energy density of 55.1 W·h·kg−1 at a power density of 799.8 W·kg−1 with the optimized Ni-Co-S-W core/shell nanosheets as the positive electrode, activated carbon as the negative electrode, and 6 M KOH as the electrolyte. Weidong He and Zhifu Liang contributed equally to this work. Supplementary material (low and high magnification SEM images of Ni-Co-S@Ni-W-O (20 min)/NF and Ni-Co-S@Ni-W-O (80 min)/NF, the CV and GCD curves of the activated carbon (AC)/NF, the specific capacitances of AC/NF at different current densities) is available in the online version of this article at https://doi.org/10.1007/s12274-017-1757-2. This work was supported by the National Natural Science Foundation of China (No. 51672109), National Basic Research Program of China (No. 2015CB932600), Program for HUST Interdisciplinary Innovation Team (No. 2015ZDTD038) and the Fundamental Research Funds for the Central University (No. 2017KFKJXX007), Natural Science Foundation of Shandong Province for Excellent Young Scholars (No. ZR2016JL015), Scientific Research Foundation of Zhejiang A&F University (No. 2014FR077).